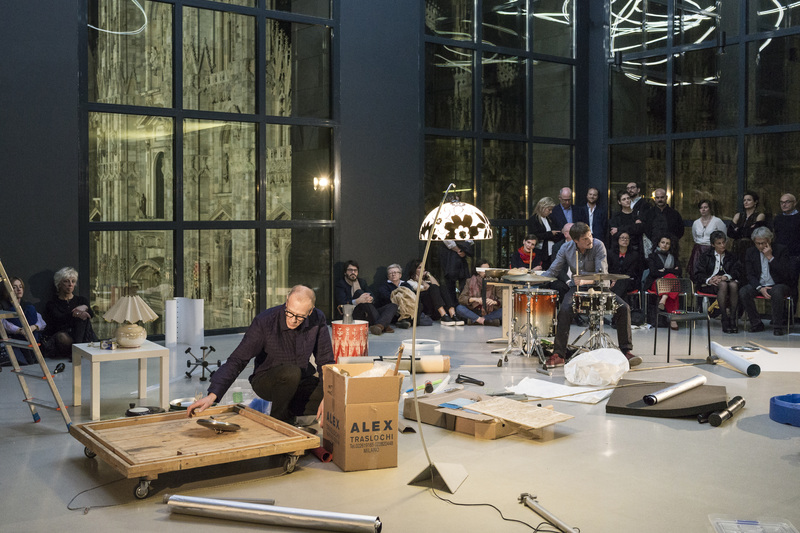 Christian Marclay presents an improvisation-based musical performance in which the sounds of instruments blend with noises made by everyday objects. 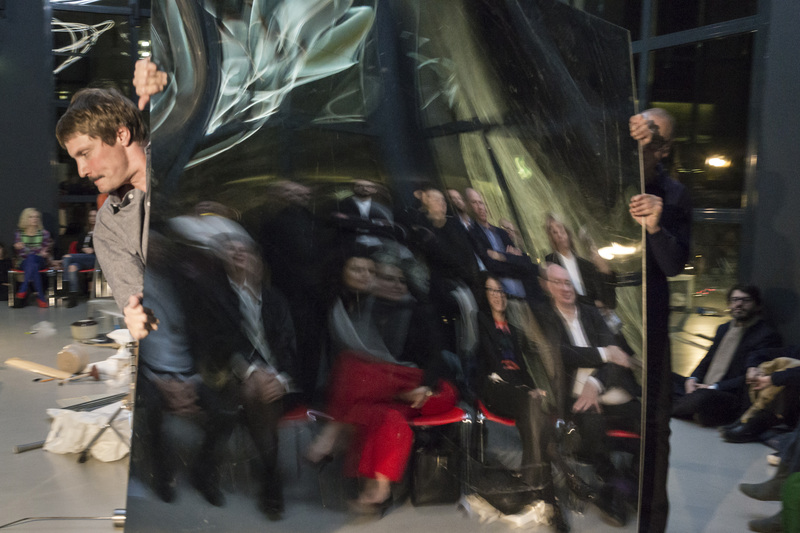 On the occasion of the 23rd edition of miart and the Milanese Art Week, Fondazione Furla and Museo del Novecento present Concerto Spaziale, a performance conceived by Christian Marclay, as the last event in Furla Series #01. Artist, musician, and composer Christian Marclay began interweaving performance, sound, and visual art in the late 1970s, when he used vinyl records to create the kind of surreal assemblages and visual puns that immediately became a recurring feature of his work. Marclay became a virtuoso of collage, a technique he still employs at various levels in sculptures, installations, and videos, as well as in music, film, and performance. Over the years, through composition and experimentation, he has created a “theater of found sound” influenced by Duchamp, with a unique, innovative approach that has inspired an entire generation of musicians and artists. 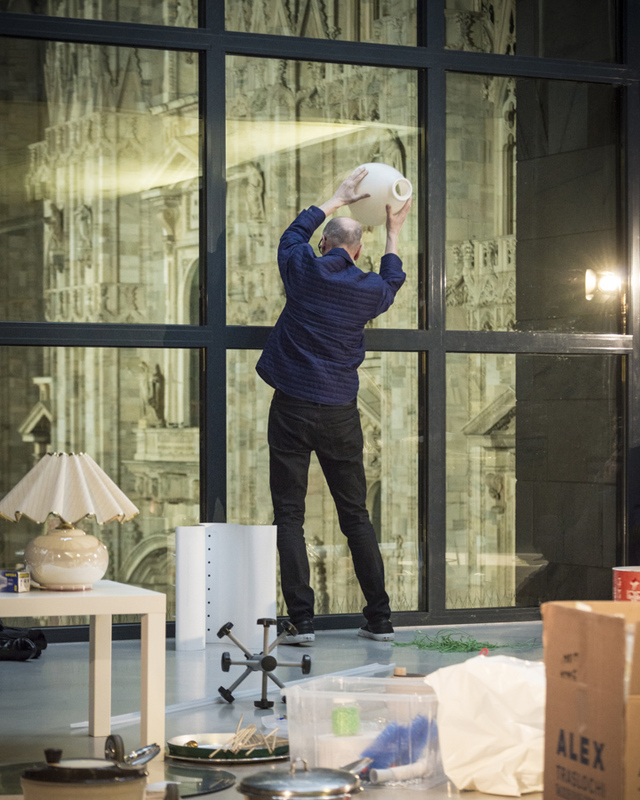 In the Sala Fontana, Marclay will present Concerto Spaziale, an improvisation-based musical performance in which the sounds of instruments blend with noises made by using, striking, and rubbing everyday objects he has come across during his stay in Milan. 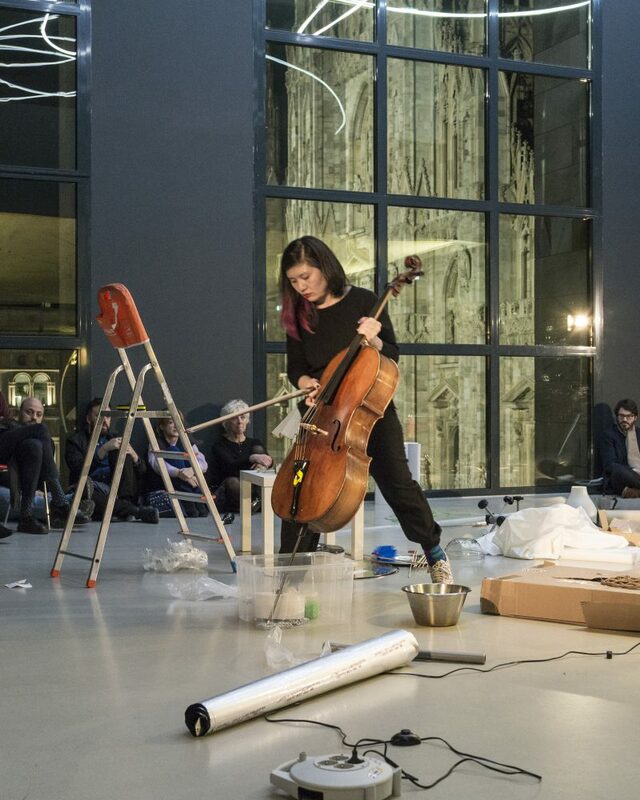 Performing along with him are South Korean cellist Okkyung Lee and Swiss percussionist Luc Müller, creating a free-form composition that mingles music with acoustic and visual stimuli, while the space itself is activated by the performers. Unlike Music Concrete, where sounds are recorded and distorted in playback—by slowing or speeding up the recording, or highly amplifying it—Marclay believes in the natural acoustic potential of any object and will not amplify them. A musician without instruments, he skillfully composes a concerto in which every noise is music. Born in 1955 in San Rafael, California. Lives and works in London and New York. For more than thirty years, Marclay has been exploring the connections between the visual and the audible, creating works in a wide range of media, including sculpture, video, photography, collage, music, and performance. Marclay’s work has been shown in museums and galleries worldwide. International solo exhibitions include the Staatsgalerie in Stuttgart (2015); Musée d’art moderne et contemporain in Geneva (2008); Hammer Museum at UCLA, Los Angeles (2003); San Francisco Museum of Modern Art (2002); Museum of Contemporary Art, Chicago (2001). In 2010, the Whitney Museum of American Art hosted Christian Marclay: Festival. For over twelve and a half weeks, this groundbreaking exhibition featured daily performances by world-renowned musicians and vocalists, exploring Marclay’s vast oeuvre. In 2011, Marclay received the Golden Lion award for best artist at the 54th Venice Biennale for his virtuosic video The Clock. First premiering in London in 2010, The Clock has since been exhibited worldwide in more than twenty venues, including the Centre Pompidou, Paris (2011); Museum of Modern Art, New York (2012); San Francisco Museum of Modern Art (2013); and Guggenheim Bilbao (2014). Since 1979 Marclay has performed both solo and in collaboration with many musicians, including John Zorn, Elliott Sharp, Otomo Yoshihide, Butch Morris, Shelley Hirsch, Okkyung Lee, Mats Gustafsson, and Lee Ranaldo. Born in 1975 in Daejeon, South Korea. Lives and works in New York. Okkyung Lee is a cellist, composer, and improviser who moves freely between artistic disciplines and contingencies. Since moving to New York in 2000 she has worked in disparate contexts as a solo artist and collaborator with creators in a wide range of disciplines. A native of South Korea, Lee has taken a broad array of inspirations—including noise, improvisation, jazz, western classical, and the traditional and popular music of her homeland—and used them to forge a highly distinctive approach. Her curiosity and a determined sense of exploration guide the work she has made in disparate contexts. Born in 1973 in Switzerland. Lives and works in Lausanne. After studying Jazz Drumming with Marcel Papaux and occasionally with Pierre Favre and Daniel Humair at the Lausanne Jazz and Contemporary Music School (EJMA), Müller now dedicates his time to contemporary and improvised music. By using various miscellaneous objects and creating percussive “instrumentariums” adaptable to his various musical projects, he expands, explores, and modifies the drum set’s traditional acoustic sounds. He regularly contributes and performs for other art forms such as theatre, visual arts, literature, dancing, cartoons and films. Among other, he is a member of Ensemble Babel, a contemporary music ensemble who has often collaborated with Christian Marclay.